Ever watch one an award shows on TV and wish you could score some of the awesome swag that the celebrities take home? 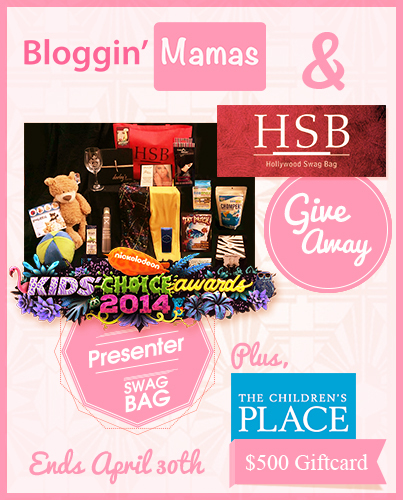 I’ve teamed up with Bloggin’ Mamas & Hollywood Swag Bags through this sponsored post to make that wish a reality. One lucky winner will receive a Swag Bag that was given out to Nickelodeon Kids’ Choice Awards 2014 Presenters and Nominees ($800 Value) + a $500 gift card sponsored by The Children’s Place. Who doesn’t love a Swag Bag and Gift Card Giveaway? The giveaway starts 4/17/14 at 12:01 AM EST and ends 4/30/14 at 11:59 PM EST. It’s open to United States Residents 18 and over. Winner will be selected via random.org and notified via email within 48 hours after the drawing. Winner will have 48 hours to respond or a new winner will be selected. Winner’s name will be displayed via the Rafflecopter widget below. Buddy Ball – The Buddy Ball is a multi-functional toy that can go from a teddy bear into a ball in a matter of seconds. The soft plush also stores a variety of kid treasures inside. The company gifted the nominees with a variety of their bears named Max, Eva, Landry, and Sam. OPPOS – A line of girls leggings featuring interchangeable legs. Short for opposites, OPPOS™ enables girls to mix and match the legs of their leggings for a different look every day of the month (and beyond). Ericka La Presle-Freer, creator of Starbars is added her gourmet organic superfood bar in a delicious mint chocolate chip flavor. SeaSnax, a favorite among celebrities, launched a new product “Chomperz” to all the recipients. Chomperz can be described similar to a chip, but with the low calories and nutrition of seaweed. SeaSnax are gluten-free and all natural. Try Chomperz and you will be hooked. Crave Naturals included three items from their product line, featuring the best-selling Glide Thru Detangling Brush, Whiplash Eyelash Curler & Mirage Argan Oil. Focal Instincts Photography is including a gift certificate for award-winning photography.